1 The game Donna Burk was working on happened to be Nigjt Cry. 2 Unless Kojima was being facetious, he recently revealed his game will be action based, which makes sense since he is trying to develop his studio. Of course, if it's a ruse and Sony is actually helping Kojima fund a horror game, then I wouldn't complain, though they would have to start from scratch. With regards to Kojima's name being removed and dissociating him from the Metal Gear brand, I believe Kojima did indeed know that Konami was thinking of going ahead with restructuring plans to rename all their divisions to generic Konami internal team numbers, which is why he included the hidden mission within Ground Zeroes. But as of this time I think Kojima still intended to work at Konami even if his name was removed as far as the Kojima Productions brand was concerned. The P.T. project was begun because Konami at the time when their plan was to more heavily invest in game console development and green light the FOX Engine for internal use, the then-president of Konami wanted Kojima to do something with Silent Hill. - Kojima wanted to keep the P.T. project as secret as possible, so the fewer people involved, the better... hence going with one platform holder is mroe convenient as far as a simple reveal was concerned, it didn't mean that Silent Hills wouldn't come to the Xbone/PC with P.T. included in the package as a bonus. - Given a PC release of P.T. would just make it easier for someone to open up and search through the files, if Kojima wanted to keep the reveal secret as long as possible, a PC release would be out of the question. it would have to be console. - Sony has a much larger presence and a more long term relationship with Kojima. And given PS4 had the largest install base, it makes even more sense to go with them. - Kojima was gathering player data and statistics from P.T. which he discussed at Tokyo Games Show. Sony is more likely to open up PSN data to him than Microsoft would with Xbox LIVE as for a long while PSN has been known to be a more friendly platform willing to buck rules for developers. Though even Xbox LIVE does of course give various feedback and statistical data to publishers, so this point may not necessarily be valid. But there is the additional detail of the more social sharing/streaming capabilities of PS4 that made more sense for Kojima by having player collaboration over PSN. - It seems that Sony and not Konami is listed as the publisher of P.T. So perhaps Kojima's idea of making and distributing a free demo to act as a trailer did not sit well with Konami, and thus it is likely he pitched the idea to Sony and Sony might've bankrolled it. We know Konami had to be aware of it due to the other pitch conceptual video revealed at TGS that was originally shown internally at Konami and likely to Sony as well. - I don't buy that Konami wasn't aware of Del Toro & Reedus' involvement. This isn't something Kojima would have any reason to hide, and he was already using Keifer Sutherland and had hired Hollywood talent for previous games anyway such as Harry Gregson Williams. And as we've seen if anything Japanese developers, particularly Square Enix, love associating Western celebrities with their products, if only to be more appealing to Western Audiences as Japanese audiences decline on console. - It might be plausible that P.T. 's reveal trailer was an attempt by Kojima to highlight that his name alongside Del Toro and Reedus' was a good marketing point and thus to maintain the Kojima Productions brand. - Given Silent Hills big reception and that Kojima and co. were hyping it up at conventions, notably a large one at TGS dedicated to it with T-Shirts and everything, all this points towards the idea that Kojima was completely intent on remaining at Konami with his team and technology to make Silent Hills once MGSV was finished. - One point I do believe about the video is that the messages in P.T. may indeed be subtle insults towards Konami's management, particularly of the Silent Hill brand, though I think it's a stretch at that point to assume Kojima knew he was leaving Konami as everything afterwards suggests Silent Hills at Konami was a sure thing. - Another point that the video does overall bring up is that Kojima may have been in secret negotiations with Sony for awhile. I am inclined to believe this is true, but only after the fallout between Kojima/Konami became more official. - Despite what Kojima said in a recent interview, I think he did indeed have something a bit more substantial to show Sony to get his new studio off the ground. He's not necessarily lying about not having to do a full-on presentation, but there definitely had to be enough there to pitch something to Sony to take a chance on him. - Kojima said he was doing an action game. But this doesn't mean it couldn't have horror elements, maybe even ideas he and Del Toro had for Silent Hills... But I doubt this will be that, as Kojima probably wants to really do justice to his collboration with Del Toro and Junji Ito and will save it for after he's got his studio up and running and thus given the road ahead of him to get used to running and working with new staff/technology etc. he first wants to get his feet wet with a different affair first. Once the new Kojima Productions has established itself and released a few games, only then will he and Del Toro and Ito and Reedus collaborate again on a big title. That could be nine years of waiting. How old would everyone be by then? I'm thinking the horror game might be done after the first game. Horror games in general don't need huge budgets, let alone MGS sized ones. Sony might also help with the hypothetical horror title. Who knows? Also, wouldn't it be something if Kojima's next game and his hypothetical future horror game were set in the same universe? 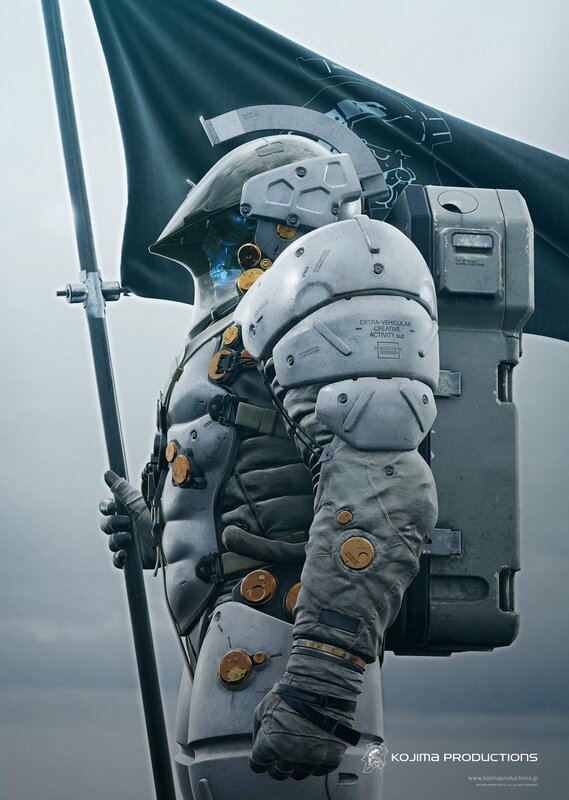 Kojima has revealed more of their mascot Ludens. Reminds me of the vashta nerada or whatever in that one episode of Doctor Who. Maybe this new game will be revealed at E3. About Death Stranding. I'm getting Horror, Supernatural, Psychological, Sci-Fi and Fantasy vibes. I love what's been shown so far. Edit: This theory is unlikely because there are simpler explanations for these chains of events. Furthermore, the human brain tends to look out for patterns, hampering its ability to see certain things for what they really are: random co-occurrences. It might mean nothing, but curiously enough, Donna Burke-who did voice acting in the Silent Hill and MGS series-retweeted the Silent Hills-Death Stranding Tweet by Python Selkan, the creators of the YouTube video. The video, the tweet and the retweet were posted on August 12, on the two year anniversary of PT, and remember that there was a tweet of Kojima standing under a PT sign in Italy on August 1. An interesting theory, but I remain skeptical. If Kojima and Sony were to have obtained the SH IP, it was only licensed out to them by Konami, so I doubt there is any greater ruse orchestrated by Kojima, Sony, and Konami among others. Junji Ito involved in Death Stranding? There does seem to be lots of imagery that somewhat similar, but I think at this point it's just reaching to see similarities. On another note it seems very possible that Mads Mikkelson is also involved.